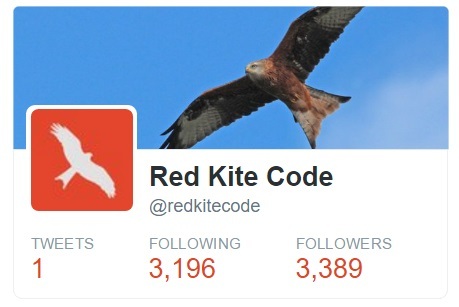 Having had many personal Twitter accounts in the past, and managed accounts for other organisations, I decided that Red Kite Code should have a Twitter. And my reasons are deeply cynical. I'm realistic and appreciate people don't want to be 'friends' with companies and for the most part they aren't interested in their messages ... that is what advertising is for. But social media has its advantages if you get it right. Below I explain how to get your Twitter account cooking. The first thing you are going to need is followers. There is no point in shouting into the interwebs if no one is listening. This is a huge problem when you begin. You have none, and you look very uninteresting. Almost everyone on Twitter is a follower snob and you will be judged by the number of followers you have. So people don't really want to follow you when only 4 other people follow you. You need to get that number up fast. It is a phenomenon known as Social Proof. Now you can buy followers and if you need some the next day, just do it, they are very cheap. However, if like me in this case you have a little time, you can do this for free and gain around 500 followers per day very easily. Fortunately on Twitter, there are a huge number of equally uninteresting accounts out there. Accountancy firms, insurance firms, solicitors, dentists etc. And they all want a slice of the social media pie, and they are all desperate for followers. And you can take advantage of this. My preference is to go onto Twitter and find a company that sells SEO ... search engine optimisation. It is very boring + they know how to play the Twitter game. Find a company with many followers and roughly the same number of people they follow. So FOLLOWING 16.1k FOLLOWERS 15.5k would be an excellent candidate. You then want to open up their followers list, and follow all the people who follow them. You'll find those random people will follow you back. Many will have an automated system to follow back anyone who follows them. You can also set up such a system using sites like https://ifttt.com/ or https://zapier.com/ . Remember at this stage you don't care who follows you, only that someone somewhere does to increase your social proof. You may only follow up to 5000 people before the 10% rule kicks in. This means to follow 6000 people, you need 5400 followers of your own. If you follow more than 125 people in a minute, Twitter will time you out forcing you to wait a further minute before you can follow anyone else. This is designed to reduce 'follower churn' ... the exact thing we are trying to acheive. I would recommend following about 800 people per day because of rule 1. I leave 200 or so because other people playing the exact same game are going to see you in the follower lists they are going through and you'll want some headroom to follow them back. Following 800 accounts can take some time ... so automate it. I like to use a google chrome extension called Twitter Mass Follow which follows people at a rate I set to 10 per second. It knows about the timeout mentioned in rule 3 above and waits to continue following + it remembers who you have already unfollowed and doesn't follow them again. Because of rule 2, you need to unfollow all the people who didn't follow you back, to make room for those who do. The Mass Twitter Follow extension linked will also do that for you. This is going to be a 10 minute ritual every day. Unfollow everyone who didn't follow you. Follow the 200 or so people who found you back. Follow another 800 people from a likely candidate. This goes on until you have enough followers. Make sure you have set a profile picture, a background and made one tweet on your new account. Other people's algorithms can detect these and choose not to follow you. Humans really don't like following 'egg profiles'. How many followers is enough? I would recommend finding about 4 times as many followers as you think you will need ... because of the next stage. So lets say with a business your size, you think 2000 followers seems like a credible number. You need to get up to around 8000 followers. You are going to be gaining about 500 per day, and playing the follow game for around 16 days at 10 mins per day. On day 16 you are going to do something very drastic. You are going to unfollow all your followers. All 8000 of them in one go. First, you don't know any of them, you don't care about any of them, and none of them care about you. And what you will find is around 6000 of them will unfollow in return in the next week or so, leaving you the 2000 you set out to get. Those 2000 aren't using sophisticated robots or algorithms to unfollow those who unfollow them. They are doing it by hand and they won't notice you sneaked off for ages. Now you have an account that reads FOLLOWING 0 FOLLOWERS 2000. You are ready to let your customers see it and share it proudly. Now you can follow back all who follow you, those who may have a genuine interest in you. It's time for you to post great content and build an organic following. Now you want to gain the interest of real customers who now won't be put off by a lack of followers. So why did we go to the trouble of getting 8000 to unfollow them? Well because an account that has 0/2000 ranks much higher in twitter search than an account that is 8000/8000. If you have a high follower to following ratio, Twitter and Google for that matter, perceive you as a more important influencer, someone with gravitas and a following ... not just another followback junkie. And you also add your website URL to your profile. Higher ranking Twitter profiles give better link juice to your site. Your website may rank higher on Google because you are perceived as having that following. I did say my reasons were deeply cynical.